These caps have a special hi-tech mesh back and sides to make them tear resistant while allowing for air flow, making them perfect for sports activities. It comes with a black front and white back with added white stitching on the peak as a feature look. Also available is an all-black cap with no extra features or stitching.These custom caps have a fabric covered short touch strap making them very flexible with sizing, and very comfortable on the back of the head. The combination of the sporty mesh with the traditional twill front looks great. They are low profile structured six-panel caps. This cap is most suitable for businesses, sporting groups, schools and all kind of clubs. We supply these hats in bulk, wherever you are in Australia. 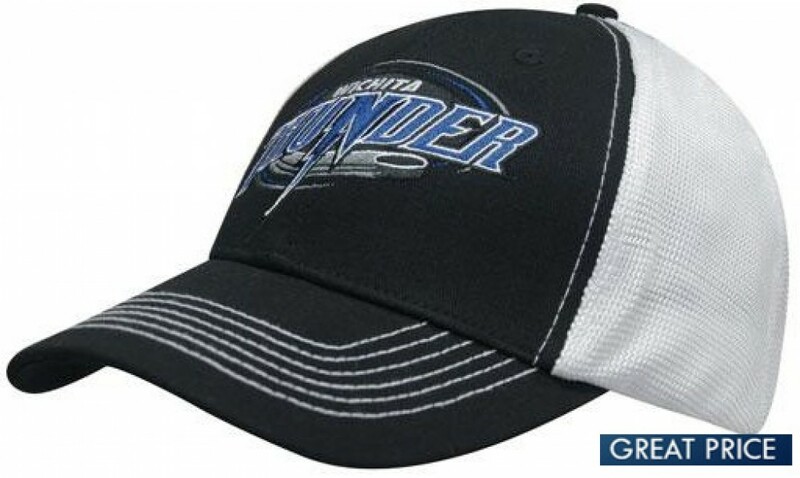 Best of all, we can print or embroider your organisation's logo onto these handsome hats. Look stylish and make a statement with these stylish mesh caps! Our listed prices for promotional headwear includes up to 8000 stitch count of embroidery. Other branding options are also available. Artwork for the cap must be supplied in eps, pdf or high-resolution jpeg. The price excludes Goods and Service Tax and delivery. It is stocked locally in Australia, ready for dispatching unbranded or customised with your desired logo using our fast one-week production timeframe.